I am in love with this laptop decal from Vati. This one is their elephant decal sticker. 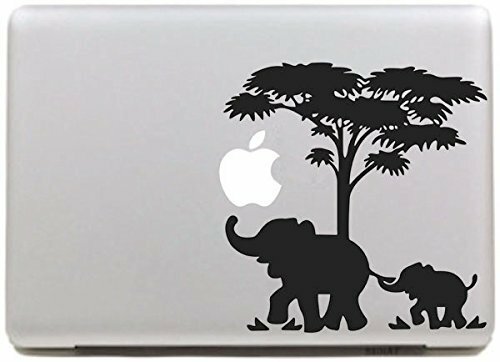 As you can see in the picture and video it has a really cool design and is very intricate, it has a mother elephant with a baby holding her tail in front of a tree. It’s a black design so it kind of looks like a shadow. These are so easy to install just peel it off the sticker sheet, place it where you want it (after you cleaned the area on your computer) and then stick it down. You can use a credit card or cardboard to smooth it but mine really didn’t need it. I simply just put it on and applied pressure. They come off just as as easy. Just peel it up. They are super neat and a great way to express your personal style on your laptop. Precision-cut, perfect fit; give your MacBook a new impressive looking. Enter below for you chance to win one!